Barnaby and I have been home in Mountain Center for what seems like ages. We spent three days in San Diego a few weeks ago, a couple of days in Palm Desert, a couple of days in San Antonio with my dad and sisters, but mainly we have been hanging in our home town of Idyllwild. Okay, we actually live in Mountain Center, five miles down the highway from Idyllwild, but there’s no town at Mountain Center, just a fork in the road and a post office. Barn and I really are gypsies at heart, so we’ll be moving back up the hill to Idyllwild soon. If we go too long without packing a suitcase we pack a box instead. It runs in my family. Some call it “pulling a geographic”, we called it “time to clean out what you don’t really want to pack”, “a fresh start”, a change of scenery can be good. When we started visiting Idyllwild regularly, back in the early 90’s, there was a beautiful shop on Strawberry Creek called the Epicurean. They sold wine, cheese, clothing and home furnishings. The space was so beautiful I would spend more time than necessary to see everything because I really didn’t want to leave the comfort of the space. Sadly, the store closed, the gate was shut and locked, and we never heard of the Epicurean again. These days, we spend a lot of time across the street from the Epicurean at Cafe Aroma, so when the “For Sale” sign went up a month ago it registered in my mind. Then the planets lined up in that way they always do when change is imminent, and I found myself driving around with Vic (our dear friend and real estate agent) looking at real estate. Since I’m a hopeless daydreamer, a view always appeals to me. But in Idyllwild, to get a big view, you have to climb up high and deal with treacherous roads and snow in the winter. Vic and I saw several beautiful perched houses. But Barnaby, always pragmatic, nixes any house on a perch. I mentioned the Epicurean to Vic, but he really didn’t want to show it to me. After several hours he relented and we pulled in. I didn’t need to fall in love, I already had all those years ago. Yeah — I know I’m always complaining about having to live with knotty pine and this house is the epitome of rustic, but there’s a beauty and peace about the place that I can’t describe. For one thing, there are big windows in every room. 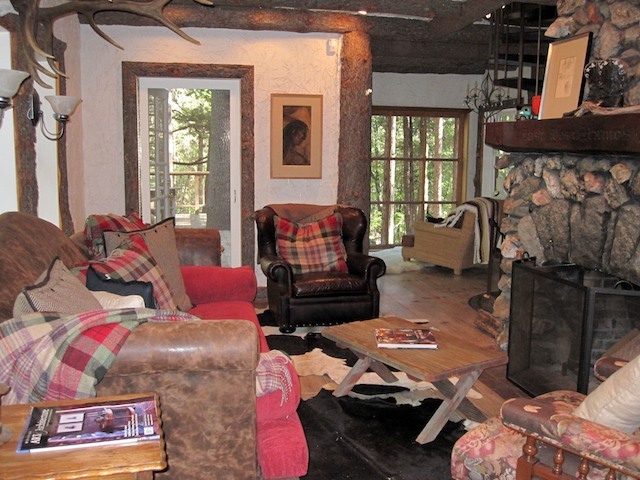 Although it’s on the creek and deep in a forest, the large windows allow for a lovely light. The square footage is small, but the layout is really perfect for us. There’s a deck with a 20 foot table — that alone sold the place to me. I can’t wait for our first party around that table. I’ll keep you posted — there will be a housewarming soon. This entry was posted on Saturday, June 12th, 2010 at 4:18 am	and posted in Uncategorized. You can follow any responses to this entry through the RSS 2.0 feed. 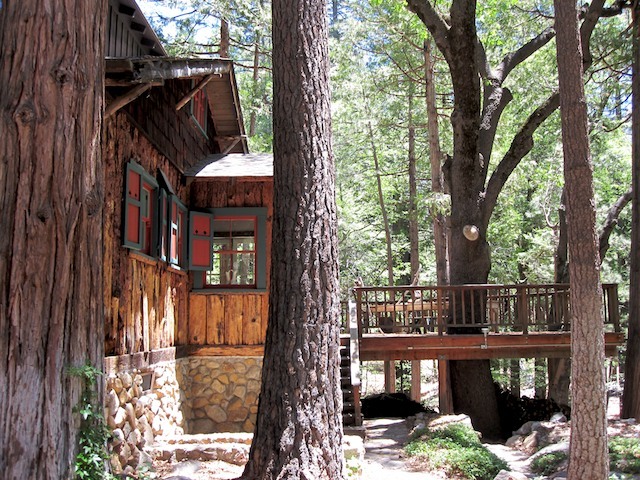 Anne, wonderful comments about Idyllwild and the Epicurean! Strangely, the auto generated possibly related post at the bottom of your notes was “Elderly Chicago couple rescued from trash filled home”. Is that something we should be concerned about? I have no idea what you’re talking about — “Elderly Chicago couple???”. I’m puzzled! Well, never let it be said that the Finches allow moss to grow underfoot! Congratulations on your new palace. Can’t wait to see it. We may be up this weekend, in fact.